LUPANE, Zimbabwe, Jun 3 2015 (IPS) - Seventy-seven-year-old Grace Ngwenya has an eye for detail. You will never catch her squinting as she effortlessly weaves ilala palm fronds into beautiful baskets. 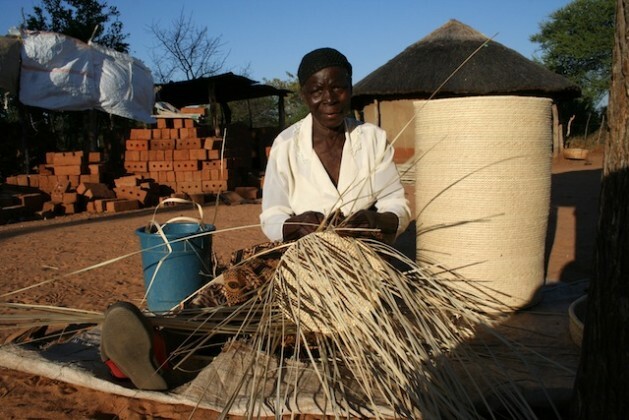 It started small, when a group of women came together in 1997 to produce baskets and other crafts from local forest products and sell them along the Bulawayo-Victoria Falls road, a major tourist route. In 2004, with the help of a Peace Corp volunteer, they establised the Lupane Women’s Centre (LWC) in order to streamline their production. At the time they had just 14 registered members. A decade later they have grown their ranks to 3,638 members hailing from 28 wards in the district. Average earnings have increased from one dollar to 50 dollars a month, and this past May one of their number earned 700 dollars from the sale of her crafts. For a community that was barely able to put three square meals on the table every day, this is a huge step towards a more wholesome life. “Weaving has transformed my life, even in my old age,” Ngwenya tells IPS, pointing to a half-built residence not far from where she sits, busily threading away. In this impoverished village, the emerging two-roomed brick house is a veritable super-structure. In addition to a dwelling place, her income has helped her buy a goat and erect a fence around her ‘keyhole’ garden, a popular farming method all across the African continent involving a keyhole-shaped vegetable bed with an active compost pile at its centre that feeds crops in the walled-in plot. At a weaving competition last year she even won an ox-drawn plough and recently sunk more of her savings into the purchase of a heifer and some simple farm tools. Considering that she joined the collective during a drought year back in 2008, she is forever grateful for her newfound wellbeing. And it is not just her own life that has changed. Barely a stone’s throw away is the homestead of her sister Gladys, and her husband, Misheck Ngwenya. This cluster of huts is distinguished by solar lights attached to their thatched roofs, a luxury secured with the boons of Gladys’ basket sales. She tells IPS the women’s centre has helped her perfect her art by improving the dimensions and measurements of her craft work. It is no coincidence that these entrepreneurs sprang from the dry soil of Lupane District. The area is a farmer’s nightmare, yielding only drought-tolerant crops such as sorghum and finger millet and receiving inadequate rainfall – just 450-600 mm annually – to allow extensive maize cropping. When the weather is bad, with long, dry spells, rural communities suffer badly. Statistics from the Department of Agriculture and Extension Services indicate that Lupane experiences annual food shortages. In 2008, it had a food production deficit of more than 10,000 metric tonnes of grain, producing just over 3,000 tonnes of cereal against an estimated annual requirement of 13,900 metric tonnes. The situation has not changed seven years later. In 2015, scores of people are at risk of hunger, with government data suggesting that only half of the region’s required 10,900 metric tonnes will be produced this year. Families who practice subsistence agriculture will be forced to purchase food to make up for lower harvests, a situation that could leave many with no food at all given that income-generating opportunities are scarce. Zimbabwe is this year importing 700,000 tonnes of the staple maize grain to cover a deficit following another bad agricultural season. The country requires 1.8 million tonnes of maize annually. The Women’s Centre in Lupane is now tackling these twin problems – hunger and livelihoods – by helping craftswomen become breadwinners. Applying a communal, grassroots approach to its management and upkeep, members contribute five dollars annually towards operational costs, accounting for 31 percent of the Centre’s required financing. The remaining 59 percent comes from donors, including patron backers like the Liechtenstein Development Services (LED), but members say they plan to cultivate greater self-sufficiency by establishing and running a restaurant, conference centre and farm which will serve the dual purpose of providing more food and skills to the community. As they grow their markets overseas, securing additional funding will not be difficult. Already members courier their wares to clients in the U.S., Germany, the Netherlands, Australia and Denmark. Revenue from craft sales tripled over a two-year period, going from 10,000 dollars in 2012 to 32,000 dollars in 2014. The members keep the bulk of the profits while the Centre retains 15 percent to cover administration fees and government taxes. 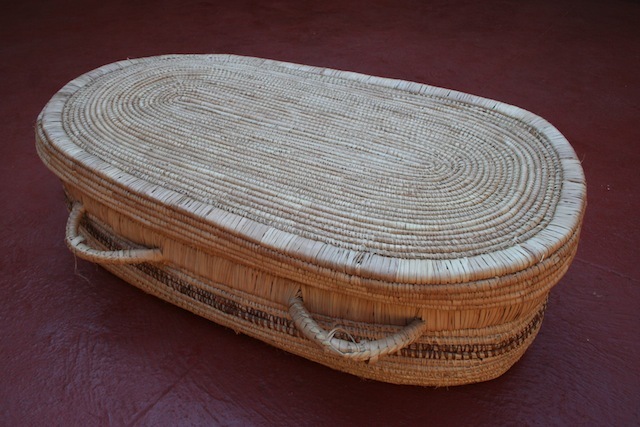 The baskets are multi-functional, doubling up as waste bins or fruit bowls. The women are now toying with the idea of turning them into biodegradable coffins – to ensure sustainability even in their deaths. They are unsure how such an idea will be received, but their bold proposal suggests a commitment to holistic living that goes beyond incomes or nutrition. Community-led buffers against the horrors of global warming are desperately needed in Zimbabwe, a country of 14.5 million that faces a host of climate risks from floods to droughts. Unable to access adequate international climate finance, the country was forced to slice its environment ministry’s budget from 93 million in 2014 to 52 million this year. The funding crunch has crippled the country’s ability to respond to natural disasters, with the meteorological services department – responsible for forecasts and early warnings – also experiencing budget cuts. This means that when calamity strikes, remote communities and especially rural women will be left to fend for themselves, a reality that the women of Lupane are more than prepared to deal with. Siduduzile Nyoni, a mother of three who joined the cooperative in 2008, says that the simple act of weaving baskets has helped her build a lifeline for times of crisis. She has used her savings to buy a goat, and is also maintaining a chicken farm and a thriving vegetable garden. When the weather is fine, the garden feeds her family. If it takes a turn for the worse, she simply dips into her surplus stores to tide her over until the land yields food again. “I joined the centre even though I didn’t know how to weave,” she tells IPS. Her husband is unemployed, but she is doing well enough to support them both. She and three other women have created their own micro-savings scheme, pooling five dollars of their monthly income into a rotational pool of 20 dollars that each enjoys on a quarterly basis. Other groups of women have taken advantage of skills training at the Centre and taken up potato farming, bee keeping, candle making, and cattle rearing. Rearing indigenous chickens is also hugely popular activity as an additional source of revenue, and nutrition. Others have turned to small-scale farming so they don’t have to rely on central supply chains for their food. 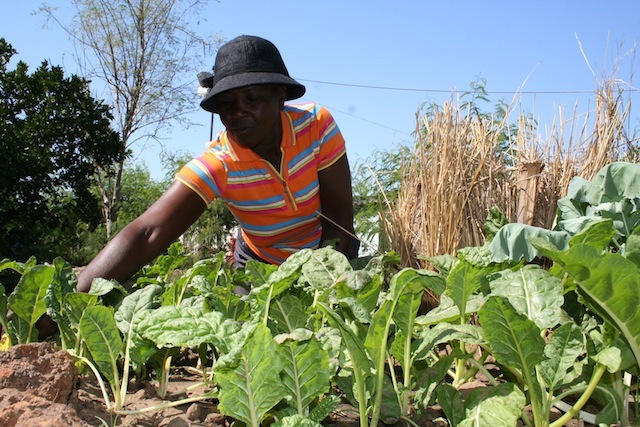 According to Lisina Moyo, who joined the Centre in 2012, keyhole gardens “should be a part of every home” – earning 15 dollars a month from her personal vegetable patch has helped her pay her children’s school fees and contribute to a savings club that keeps her afloat during harsh seasons. Perhaps more importantly, the thousands of women who comprise the cooperative’s membership are natural caretakers of forests, having practiced sustainable harvesting of forest products for years. 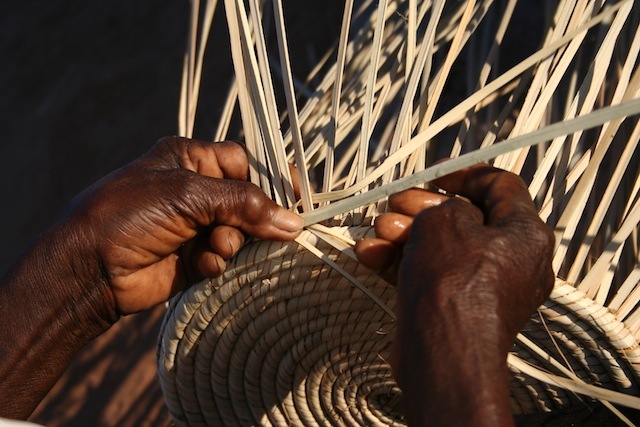 The art of basket-weaving from both ilala palm and sisal, a species of the Agave plant found in Zimbabwe’s forests whose tough fibres make strong rope and twine, has been passed down for generations. Furthermore, local communities have traditionally relied on surrounding forests for medicines, timber, fuel and fruits, so they have a vested interest in protecting these rich zones of biodiversity. Considering the country lost an estimated 327,000 hectares of forests annually between 1990 and 2010, according to the United Nations Environment Programme (UNEP), empowering guardians of Zimbabwe’s remaining forested areas is crucial. With an estimated 66,250 timber merchants operating throughout the country, as well as millions of rural families relying on forests for fuel, deforestation will be a defining issue for Zimbabwe in the coming decade. But here again, the women of Lupane are planning for the worst, creating small plantations of ilala palms to ensure propagation of the species, even in the face of rapid destruction of its natural habitat. Their work is reinforcing the land around them, and breathing life into the women themselves. This article is part of a special series entitled ‘The Future Is Now: Inside the World’s Most Sustainable Communities’. Read the other articles in the series here.